Barrelhouse boulder at The Riverside in Buford, Ga. 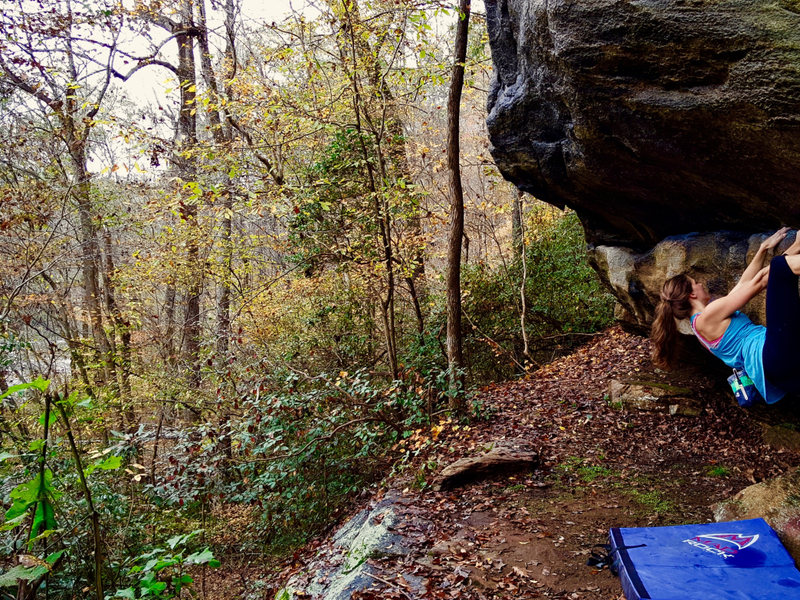 The author warms up on the Barrelhouse boulder at The Riverside in Buford, Ga. The rock here isn't of the greatest quality, but it's got something for every climber — from the V2 cruiser to the double-digit crusher. Like much of the Southeast, this area becomes a muggy, buggy nightmare in the spring and summer. Cold temps are best for the send. This area is very close to a residential neighborhood, so make sure your dog is on his best behavior — and a leash. The Riverside is among Georgia's newest climbing areas. 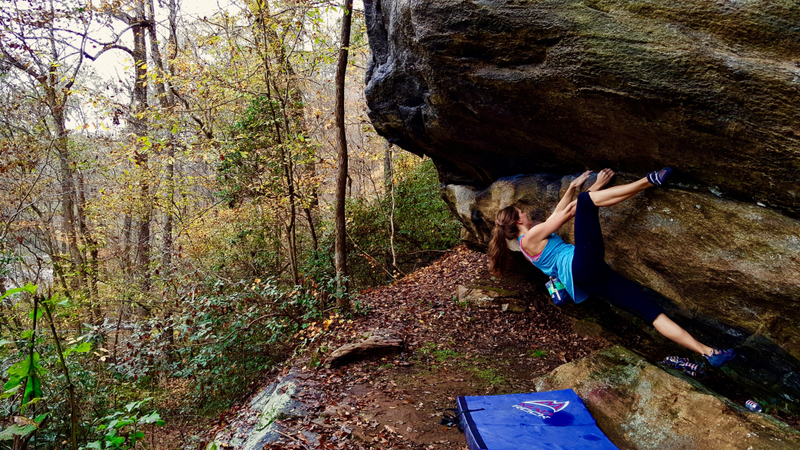 The half-mile stretch of granite boulders was discovered and developed by Atlanta climbers Lenny Galle, Robb Slocum, and Andrew Minnick in 2010. 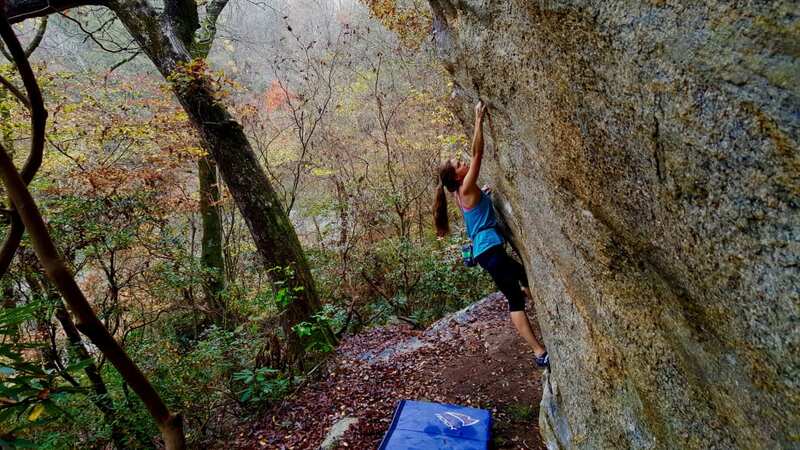 Located along the Chattahoochee River near the Buford Dam, this area is convenient for in-town climbers who aren't feeling the Boat Rock slab. This short line of boulders is home to more climbing than you'd think. There are thirteen developed areas with more than 100 problems, ranging in grade from V0 to V12. This crag has it all, from roofs and slabs to bulges and cracks. Aspiring trad masters will even find gear placement practice on a few short routes. The rock quality isn't excellent, but it's certainly better than plastic. The approach is relatively short, and the scenery is pleasant. Minimal traffic nearby makes this area more peaceful than Boat Rock. The boulders are easy enough to find, but Minnick's topo will fill you in on what's what. Atlanta climbers who are stuck in town. With an easy approach and convenient location, this crag is good for a weekday session or weekend when you can't make it out of the metro area. Park in the small pull-off, and walk past the gate. The trail begins to your right. After about five minutes on this trail, take the second right to head toward the boulders. There is no camping at The Riverside, and climbers must be off the trails by nightfall. If you're thinking about getting in the water, check the Buford Dam water release schedule at 770-945-1466. Remember that you are essentially climbing in a neighborhood, not to mention a section of the Chattahoochee River National Recreation Area. Keep noise levels low, stay on the trails, and pack out your trash. In fact, it’s a good idea to bring an extra bag for any litter you may find. Written by Sarah Anne Perry for RootsRated.